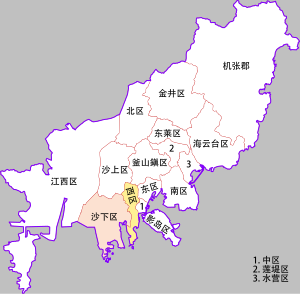 ^ 1.0 1.1 1.2 1.3 釜山广域市. 东北亚地区地方政府联合会. [2018-02-17]. ^ Busan: Population and area of Administrative units. Dynamic Busan: Busan Metropolitan City. [2010-03-24]. ^ People's Daily Online. Pusan to declare bid to host 2020 Olympic Games. 2005-11-14 [December 8, 2006]. ^ Largest Department Store - Guinness World Records Blog post - Home of the Longest, Shortest, Fastest, Tallest facts and feats. Community.guinnessworldrecords.com. 2009-06-29 [2011-09-15]. ^ 7.00 7.01 7.02 7.03 7.04 7.05 7.06 7.07 7.08 7.09 7.10 7.11 7.12 7.13 7.14 7.15 7.16 7.17 7.18 7.19 刘吉文 编著. 《韩国的地理和旅游》. 北京: 北京大学出版社. 2009年6月. ISBN 9787301144855. 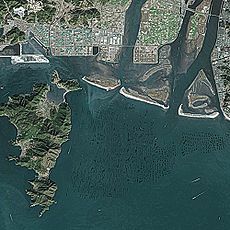 ^ Busan Port Coastal Passenger Terminal 互联网档案馆的存檔，存档日期2012-03-26. ^ Official Site of Korea Tourism Org. : Yongdusan Park. Visitkorea.or.kr. [2011-09-15].